Find a Sigil Stone by summoning a daedra and learn more about Conjuration. Speak with Phinis Gestor, after reaching level 90 Conjuration, and receive the spell, Summon Unbound Dremora. Go to the top of the Hall of Attainment and cast Summon Unbound Dremora. Speak to it, then defeat it. Cast Summon Unbound Dremora again and speak to it. Defeat the Unbound Dremora and summon it again. Talk to it and receive the Sigil Stone. Talk to Phinis Gestor and receive your reward of the Master Conjuration Spell, Flame Thrall. "You dare bring me here? You will be punished.". "You will do as I say!" "I summoned you. I control you now." "I serve no mortal!" "You control nothing, mortal!" "I am not your plaything, worm!" "Are you ready to submit?" "Admit that I control you." "Never!" "I'll tear your heart out first!" "I am not yours to toy with!" "Will you submit, or do I need to banish you again?" "I can do this all day." "I...I submit. What is your bidding, master." "No, I... I submit. No more." "Bring me a Sigil Stone. Now." "Yes, my lord/mistress. Summon me again, and I shall have your stone." "Your Sigil Stone. Lord Dagon is... less than pleased at its loss." The Sigil Stone will be added to your inventory and the Quest Objective, Deliver the stone to Phinis, is assigned. Bring the Sigil Stone to Phinis Gestor and he will give you Flame Thrall. You will also, now have the option to buy the Master level Conjuration Spells; Frost Thrall, Storm Thrall, and Dead Thrall. The Sigil Stone you are rewarded in this quest is used to unlock the full potential of the Atronach Forge. The final Unbound Dremora will remain until it is killed and can move outside of the circle in response to any threats or danger. If you have the Disarming Bash perk, you can disarm the Unbound Dremora and then pick up his weapon. If you cancel the dialogue and sneak behind it, it is possible to pickpocket its weapon with a high enough skill. It carries a random enchanted main weapon and an iron dagger. You may also attack it from behind to weaken it before talking to it and resuming dialogue. But if you kill it without resuming dialogue, you will not be able to summon it again. 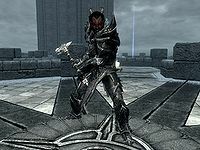 It is possible to defeat the Unbound Dremora and pick up his weapon before he has been banished. It is possible to get two Sigil Stones. Once the Sigil Stone has been received from the Unbound Dremora, it can be placed in the Atronach Forge. You can then go to Phinis Gestor and 'give' him the stone, when you talk to him again and ask "What did you see?" he will thank you and give you the second Sigil Stone and Flame Thrall. Daedric Atronach Forge recipes will begin to show up in random loot after completing this quest. The Unbound Dremora summoning sequence may result in freezes or may not complete. If it gets stuck, reloading and trying again should fix it. The Dremora will automatically attack Barbas, Delphine, or Esbern, if any of them are with you. This will make the quest impossible to complete, as the Dremora will not open dialogue and these characters cannot be killed. Taking them to another zone and telling them to stop following you, will allow you to continue. If you need to keep your follower, then summon something else far enough away (maybe a Dremora Lord if you purchased the spell) and tell your follower to attack it. While they are fighting, run to the summoning spot. The quest should proceed normally. The Dremora may not leave after having given you the Sigil at the last summoning. He will instead stand there in a state where he cannot be damaged nor interacted with. 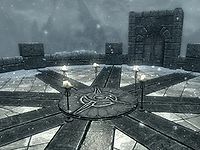 If you have finished the quest, however, this will not impact the ability to summon Dremora Lords or use the other Master spells. Once the Sigil Stone is delivered to Phinis Gestor, the Flame Thrall spell may not be given. If this occurs, loading the last save or autosave and trying again should fix the issue. Defeating the Unbound Dremora while it is paralyzed can cause it to die and leave a lootable corpse rather than simply be banished. This breaks the quest and requires you to reload a save to complete it. Disintegrating the Unbound Dremora will leave a lootable ash pile rather than banishing it. This also breaks the quest and you will need to reload. ? You might not be able to talk to Phinis if The Staff of Magnus quest is active. Completing that quest should fix the problem. After receiving the Sigil Stone and taking it to Phinis Gestor, he will not acknowledge it. He will go through the first two lines of dialogue then begin to walk around. The quest starter dialogue option should still be available, going through the full dialogue again fixes the problem. Reverse pick pocketing the sigil stone should allow him to recognize it in his inventory. If the Unbound Dremora is summoned during a dragon attack, the Dremora will run away. If you make your Conjuration skill Legendary before casting Summon Unbound Dremora, the Dremora won't speak with you. Mod Notes: The entire quest is contingent on the player's Conjuration skill; when the skill drops below 90, the quest becomes inactive and the OnSpellCast event that updates the DremoraFlag variable stops firing. Raising your Conjuration skill to 90 or above once again will allow the quest to proceed normally. If you attempt to give Phinis the stone after waking him up he will acknowledge the stone and therefore the quest cannot be completed. Reloading the save and waiting until he is outside of the Hall of Countenance will fix this issue. 10 Phinis Gestor has told me that in order to inscribe powerful Conjuration spells, he'll need a sigil stone from an Oblivion gate. To get one, I'll need to summon an Unbound Dremora and bend it to my will. 70 Phinis Gestor requires a sigil stone to inscribe powerful Conjuration spells for me. I subdued an Unbound Dremora and had it retrieve one for me, which I should now take to Phinis. 200 Finishes quest I have subdued an Unbound Dremora and had him retrieve a sigil stone for me, which Phinis Gestor has used to inscribe the Master Conjuration spells. In exchange for doing this, he has given me the first of the spells. The following empty quest stages were omitted from the table: 20, 30, 40, 50, 60. On the PC, it is possible to use the console to advance through the quest by entering setstage MGRitual03 stage, where stage is the number of the stage you wish to complete. It is not possible to un-complete (i.e. go back) quest stages, but it is possible to clear all stages of the quest using resetquest MGRitual03. This page was last modified on 11 May 2018, at 21:33.